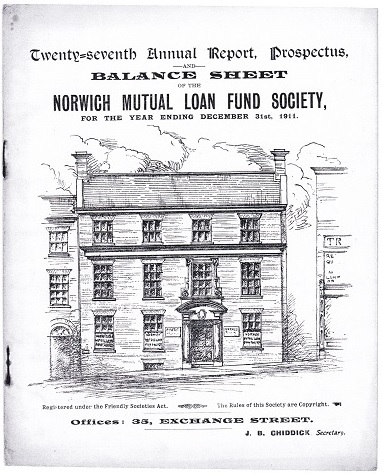 From 1907 to 1979, our present head office in Exchange Street was the home of the Norwich Mutual Loan Fund Society - so we are continuing a long tradition of 'people helping people'. The Society was established in 1885, with the object of "the formation of a common fund from which to supply loans to its members". 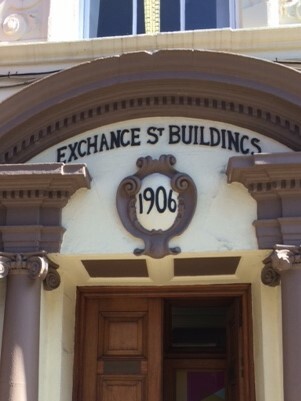 The first meetings were held in a room in Prince's Street, moving from Bridewell Alley (1890), to 17 Pottergate (1895) and finally to "commodious offices" in Exchange Street Buildings - number 35-37 today - on 22 April 1907. "...shall pay a fine of one halfpenny for every 3 shillings, or part of 3 shillings, due from him for every month that he shall omit to pay; in lieu of paying such fine, the member may at his option pay in advance such a sum as shall be equal to the amount in arrear." "...advertisements and placards were issued inviting persons to join, but later on the Society so greatly gained public confidence that restrictions had to be imposed to check the influx of persons who wished to join as investors only. For example, unmarried ladies had to be refused admission, it being found from experience that as a class they never became borrowers." 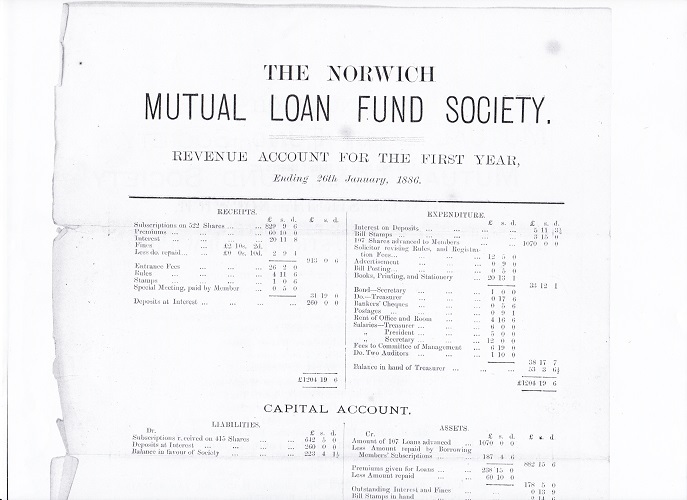 The same document gives an interesting example of "the useful work of the Society in encouraging thrift by providing its members with loans". It quoted the case of a member who took a loan out, added some of his own money, and bought two cottages. Using the rent from these, plus his share dividends, he was able to repay his original loan. He then used the cottages as security for a second loan, "with which he bought another property; and so he went on". Business declined during the Great War and didn't pick up in the post-war boom. But in 1926 "there was a greater demand for money and in the following year a record amount was loaned". By 1943, the Society had "firmly established itself in the public esteem...and there is every indication of its enjoying a still more prosperous future". "It was a sad day because of the unique nature of the society and the service it had given to the public for generations." 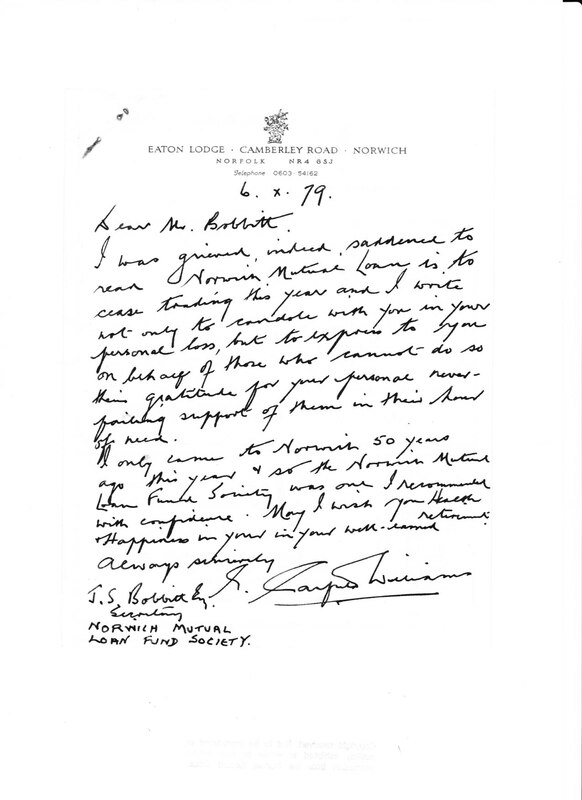 "I was grieved, indeed, saddened to hear Norwich Mutual Loan is to cease trading this year and I write not only to condole with you in your personal loss, but to express to you on behalf of those who cannot do so their gratitude for your personal never-failing support of them in the hour of need." 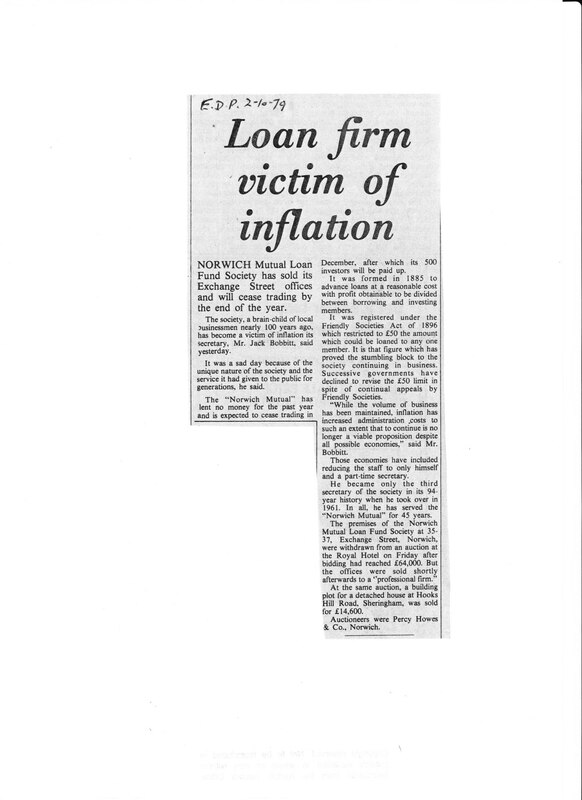 Just a decade later, in 1989, Norwich Community Cooperative Credit Union was set up - coincidentally across the road at number 38 Exchange Street. Today we are known simply as Norwich Credit Union and continue to grow. The credit union has expanded its common bond to increase access and now has service points in Dereham and Great Yarmouth, as well as Norwich. Anyone who live or works in any Norfolk postcode is welcome to join us, including unmarried ladies! The original documents of the images displayed on this page are held by the Norfolk Record Office under the reference: NRO, ACC 2003/131.